SOUTHINGTON - Groggy Frogg wowed the crowd with their wings Monday at Cadillac Ranch, earning the title of Best Wings, Hottest Wings and Most Original Wings in Southington. Sizzling, spicy, sweet and savory wings filled the air with mouth watering aromas as crowds moved from table to table. The event was absolutely packed and many vendors ran out of their initial batch of wings and had to get more. Once people’s hunger had been sated and their taste buds tested, it was time to cast their votes. When voted were tallied Groggy Frogg swept all categories. Craft Kitchen took runner up for best overall, Buffalo Wild Wings was runner up for hottest and Southington Bread For Life was runner up for most original. 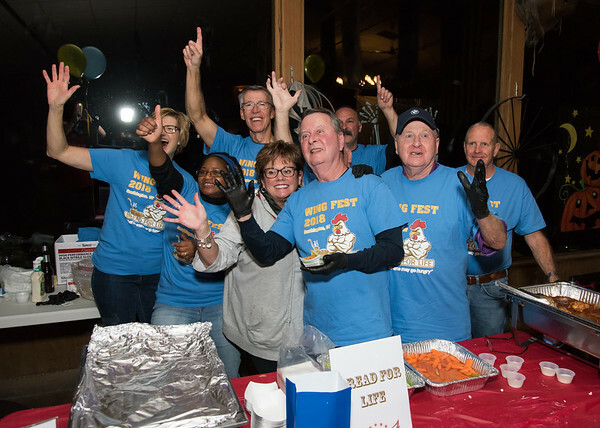 Participants in this year’s Wing Fest included Groggy Frogg, Chili’s, Craft Kitchen, Buffalo Wild Wings, Castello’s Pizza and Southington Bread For Life. Cadillac Ranch also allowed people to sample their wings but didn’t participate in the contest. 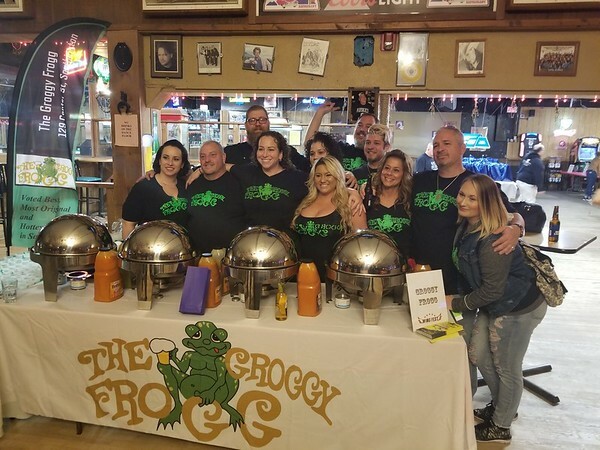 Mark Montana, owner of Groggy Frogg, said the crew wanted to “do right by the man” this year in memory of late former owner Mike Montana, who died last May after winning last year’s event. They brought out about a half-dozen different flavors. Shortly before winners were announced, the Chamber held a moment of silence in Mike Montana’s memory. Nina Zampino, bartender at Chili’s, said the restaurant has come to Wing Fest for about five years. This year they brought out barbecue, buffalo and honey chipotle wings. Chris Bressan of Southington, who has come to Wing Fest for three years, brought his girlfriend, Deanna Cinami, along to experience it for the first time. Faith Tonnotti, owner of JC Tonnotti Window Company, said she has been bringing her whole company to Wing Fest for the past three or four years. Both Tonnotti and Heather Magnoli, an employee sitting with her, said they liked Craft Kitchen’s wings. Baulyne Grande came to Wing Fest for the first time Monday. David Derynoski, from the town Board of Education, said he thought Groggy Frogg had the best overall wings. Posted in New Britain Herald, New Britain, Southington Herald on Monday, 5 November 2018 20:53. Updated: Monday, 5 November 2018 20:55.